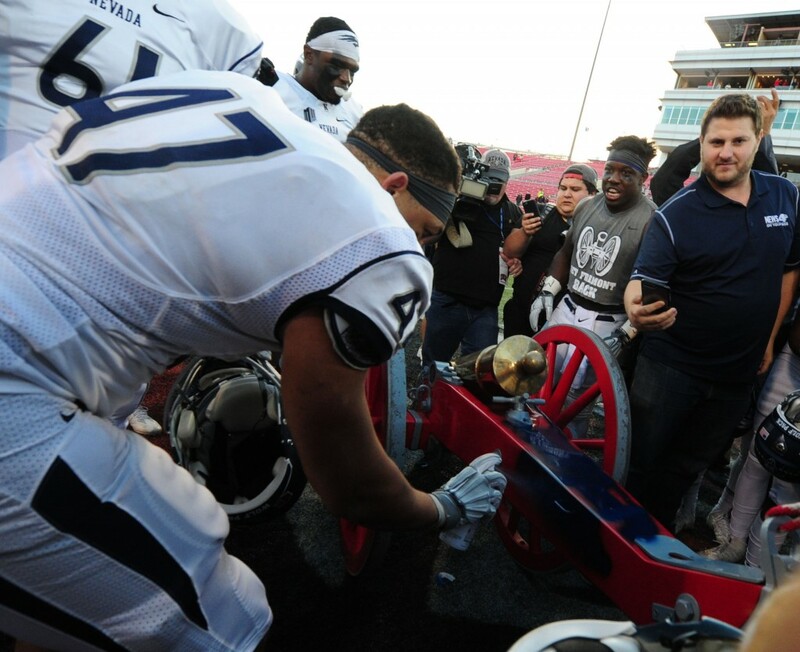 The Fremont Cannon is a blue again following Nevada’s stunningly one-sided 45-10 victory over UNLV on Saturday afternoon before a crowd of 23,569 at Sam Boyd Stadium. The Rebels, meanwhile, are simply black and blue. “They just took us out to the woodshed today,” UNLV coach Tony Sanchez admitted. That might have been putting it mildly. 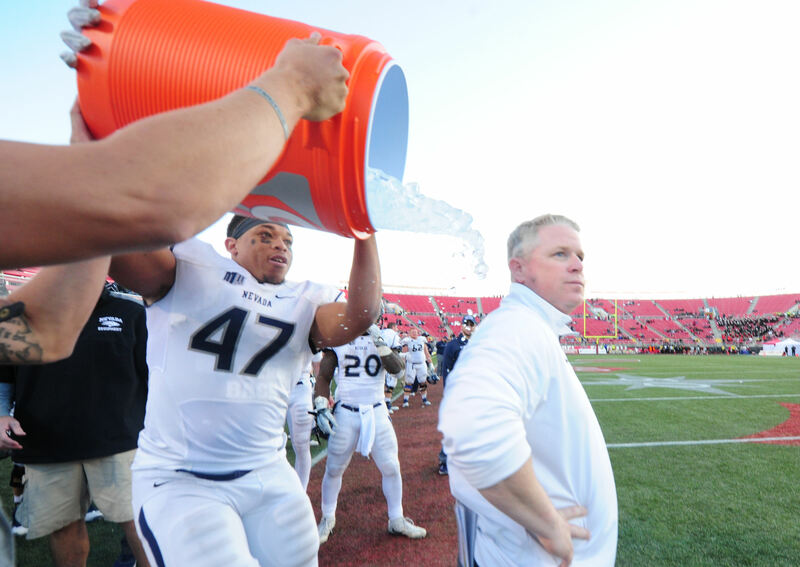 The Wolf Pack (5-7, 3-5 Mountain West), a 10-point underdog perhaps playing to save head coach Brian Polian’s job, jumped out to a 17-0 lead before the game was barely over a quarter old, led 27-10 at halftime and then outscored what looked like a tired and listless UNLV (4-8, 3-5) squad 18-0 in the second half to put an exclamation point on the lopsided victory. * The Wolf Pack, which entered the game with the nation’s worst rushing defense, finished with a 318-182 rushing edge and a 511-303 advantage in total yards. * Nevada had more first downs rushing (16) than UNLV had total (14) and finished with a 27-14 edge in first downs. 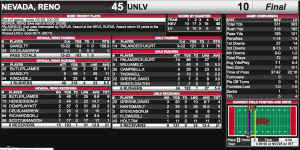 * The Wolf Pack controlled the ball for almost 38 minutes (37:42) while UNLV had it for just 22:18. 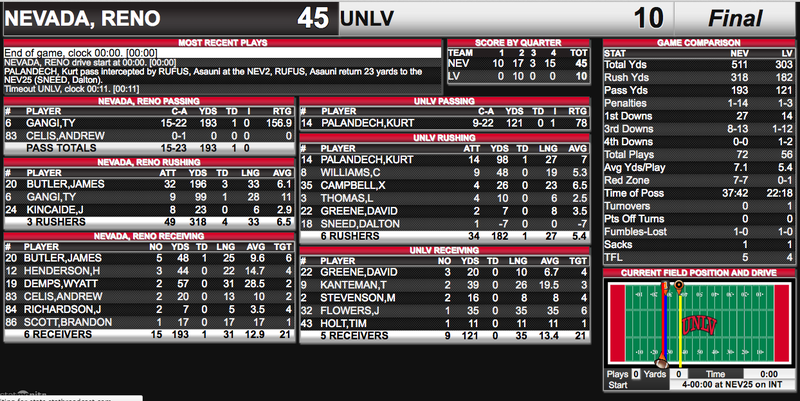 * Nevada was 8-of-13 in third down conversions while UNLV was 1-of-12. * The Wolf Pack, which was a perfect 7-of-7 in the red zone, averaged 7.1 yards per play. Junior running back James Butler led the way for Nevada, rushing for 196 yards on 32 carries including touchdown runs of 33, 3 and 13 yards. He also caught a 14-yard touchdown pass from sophomore quarterback Ty Gangi that made it 27-7 with 2:05 left in the first half. Gangi started the ball rolling for the Wolf Pack with a 19-yard touchdown run to cap a 65-yard, eight-play game opening drive. He finished with 99 yards rushing on nine carries and also completed 15-of-22 passes for 193 yards and touchdown. One of the few highlights for UNLV was a brilliant 27-yard touchdown run by quarterback Kurt Palandech in the second quarter. Palandech, who rushed for a team-high 98 yards on 14 carries but completed just 9-of-22 passes for 121 yards, no touchdowns and an interception, swept to his right and then zig-zaged his way to the middle of the field and the end zone, breaking six tackles along the way. The play came in at No. 2 on ESPN SportsCenter’s Top 10 Plays of the Day (See VIDEO above). UNLV, which improved its win total by one for the second straight season under Sanchez, lost its season finale the seventh straight year dating back to a 2009 win over San Diego State.